Like the modern Park, William Pryor Letchworth faced the challenge of balancing visitor safety with accessibility. 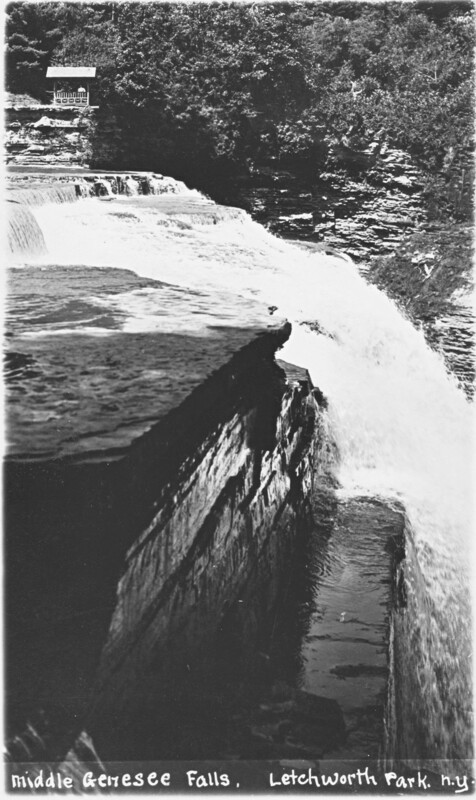 He had worked hard to restore the natural beauty of the popular Middle Falls, and certainly wanted visitors to enjoy it. Although there were no rules about wading about in the river above the falls, the two areas that provided the best view of the Falls and its rainbow posed a danger to careless visitors. So Mr. Letchworth built two wooden overlooks - one shown in Image 109, and the second one shown below. The photographer was standing on the east side of the Middle Falls when he took this image. 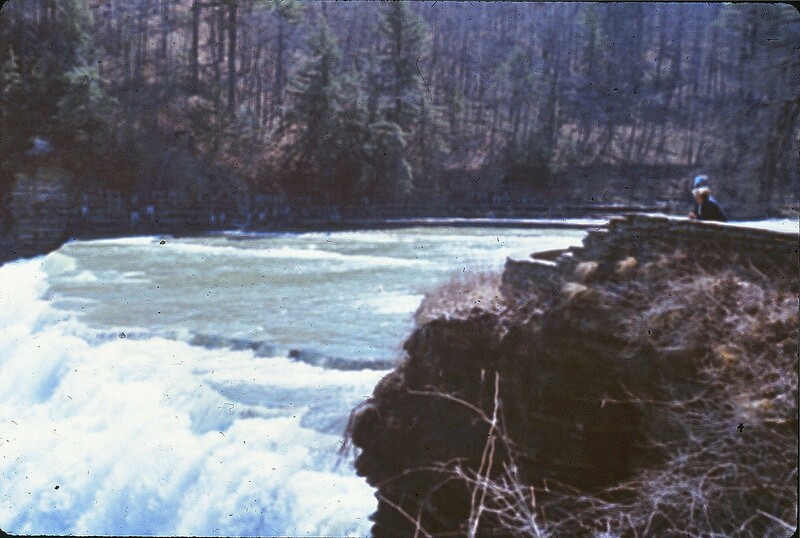 On the far bank you will see the wooden overlook that allowed visitors to go to edge of the bank safely and view the falls. Note how overgrown the far bank is, creating quite a challenge to those who want to get another view of the Falls. We thank Karen Gibson Strang for sharing this view with us! 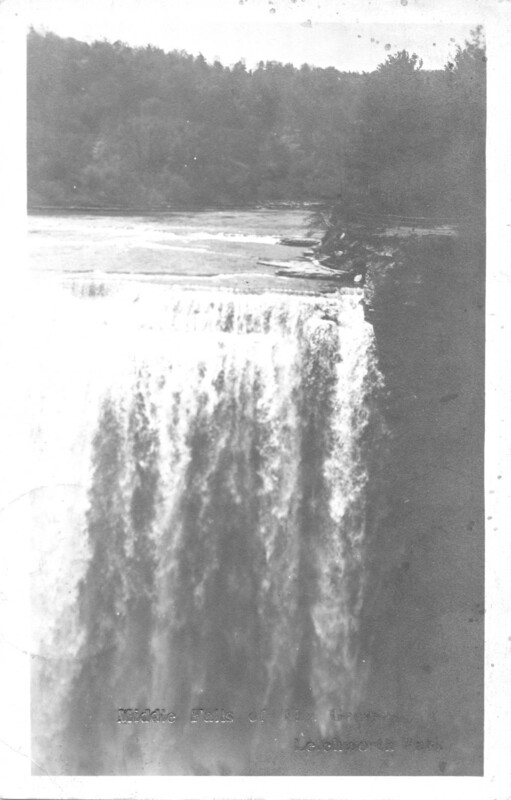 Mr. Letchworth had the overlook built on the site of an earlier mill (see Image 1) probably in the late 1870s or 80s. 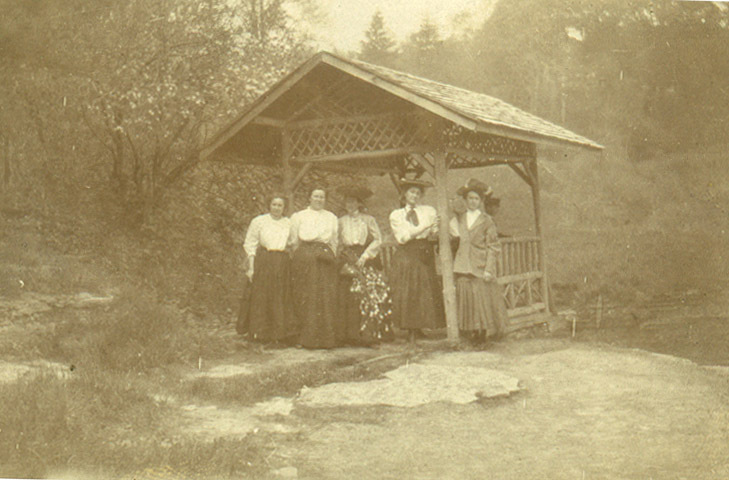 The image below shows a group of tourists posed in front over the structure, with the gorge below the falls behind them. Note that the woman in the middle has a sprig of spring blossoms, possibly from a tree nearby. This image was probably taken before 1914. The overlook can be seen on the top of the bank to the right of the photograph. 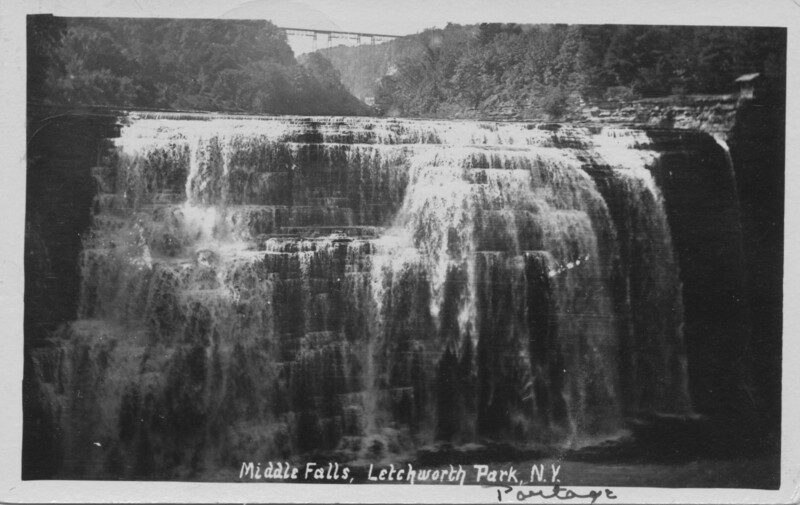 The overlook was removed by the American Scenic and Preservation Society as they reshaped the grounds after Mr. Letchworth's death in 1910. The second postcard below, also postmarked 1914, shows a wooden fence along the bank in the area of the overlook. This change was probably made between 1912 and 1914. Now stone walks and walls both protect the visitors and provide great views of the Middle Falls, Devil's Oven, and, on most days, a beautiful rainbow! The photo to the right shows my Mother, Margaret Cook at the Middle Falls overlook on her last trip to the Park in the spring of 1991.